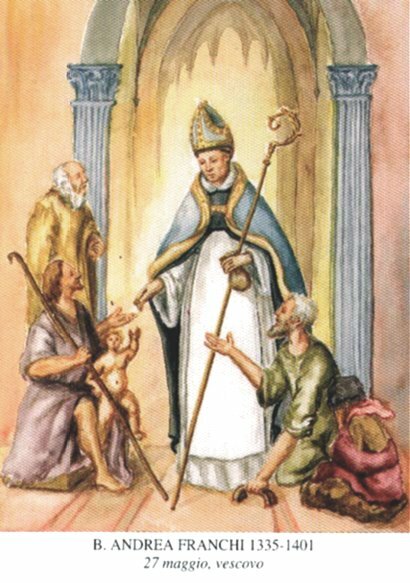 Blessed Andrew was born into the noble dei Franchi Boccagni family. He entered the Dominican Order at Pistoia about 1351, when the Italian peninsula was still under the shadow of the plague and was deeply involved in fratricidal wars. Another theory has it that he entered at Florence in 1348, which was the year the plague reached its peak. Whichever date he entered, he did so to give attention to his immortal soul, at a time when the world around him was apparently falling to pieces. Andrew proved to be a good religious and an able administrator. He served as prior in three convents while still quite young. In 1378, he was appointed bishop of Pistoia, an office he filled with distinction and holiness for 23 years. It is written of Andrew that he devoted himself to the poor, and spent his revenues to relieve their misery and to rebuild the ruined churches. He had a great personal devotion to Our Lady, to the Holy Childhood, and to the Three Holy Kings. As bishop, he lived a life of extreme simplicity, retaining his religious habit, and as much as he could of the rule. A year before his death, he resigned his office and retired to die at his old convent of Pistoia.